Zillable™, an innovator in collaboration and innovation, unveils the world’s first collaboration and innovation platform specifically designed for forward-thinking teams and enterprises of 10-10,000 members to collaborate and innovate on any device and from any location. "Zillable is like your digital coffee shop where teams collaborate and innovate - seamlessly at ease,” Andrew Pham, CEO and Founder of Zillable explained. "The enterprise can create private collaboration networks that dissolve departmental silos and streamline the way employees get stuff done, innovating faster.” Public communication channels may also be employed by the enterprise, engaging the Crowd and fine-tuning predictions for market shifts and internal company strategy. 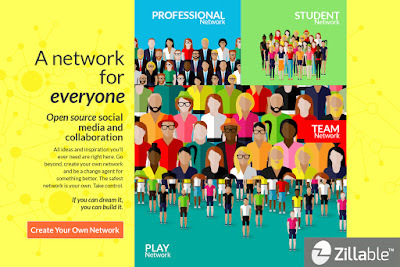 Zillable is the world’s first collaboration network where teams can creatively and dynamically work, ideate, and innovate. Teams of any size can engage employees and bridge divides, including partners and customers. Zillable makes work and innovation happen. For more information, please visit Zillable.com.